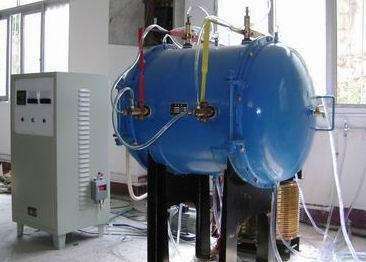 The graphite vacuum furnace is an ideal vacuum atmosphere sintering equipment. It can be widely used in the fields of stainless steel, titanium, space materials, silicon carbide wafers, other metal and ceramic welding, surface treatment, heat treatment and so on. The vacuum furnace consists of furnace, electric furnace shell, seal, vacuum system, sealing furnace shell is welded by 5mm cold rolled plate made with removable parts surface by vacuum sealing material, to prevent the furnace shell deformation after heating and sealing material thermal metamorphism, furnace shell with circular pot, and water located in the furnace cooling, sealing furnace shell, can be square or round, according to the different temperature, the heating element is different, the furnace body horizontal layout. The working temperature, the limit vacuum degree and the working vacuum can be designed according to the customer’s requirements. The 1. purpose is vacuum chamber furnace or vacuum atmosphere sintering furnace. It is specially designed for sintering materials under vacuum and certain atmosphere, such as inert gas, oxygen and so on. 12. heating rate: the heating rate can be adjusted freely, and the adjusting range is 40 degrees per minute (30 degrees /min*** slow heating rate).